Alan Ryker is a completely new writer to me. I joined the DarkFuse book club recently and was introduced to his work at the club's forum. And I'm glad that I was because his novella, The Hoard, is something completely original wrapped up in a wonderfully told tale. The Hoard is about Anna, an elderly hoarder who's found herself in trouble with Adult Protective Services. Her son and his family are neighbors and, although they all know that there's something wrong with Anna and the inside of her home, no one wants to be the one to enter her house. Or worse, confront her about it. When Anna is finally forced to leave her home and live with her son, they all can't help but notice that there's something wrong with her. Something seriously wrong. What nobody knows just yet is that there's a new type of parasite dwelling within the dirt and mounds of garbage, and maybe even Anna herself. The character's in The Hoard are all very well realized and they are one thing that makes this book shine. The characters, in fact, begin to feel like your own family and friends. Another thing that makes the story shine is the personal and dramatic look into a family suffering from mental illness and severe hoarding obsessions. Without these two elements, this could have very well been nothing but another zombie-like story. The Hoard is nothing like another zombie-like story at all. 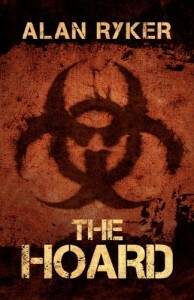 I highly recommend The Hoard if not for it's originality and fresh story telling, but for the people who populate it. Give it a try and I'll doubt you'll be disappointed.